I am inspired by others, as I most often am, to address a common issue that plagues many business owners and their teams. My inspiration was initiated by one, “The Knowing-Doing Gap,” a book written by Jeffrey Pfeffer and Robert Sutton, two then Stanford University educators and published by Harvard Business School ©2000, about why leaders and managers don’t “do” what they “know.” And two, Kurt Lewin’s Force Field Analysis Practical Application Tool, a change management tool that I came upon at http://www.change-management-coach.com. “The Knowing-Doing Gap” provides research-based validation and verification that most businesses don’t suffer from not knowing the right things or even the right ways to do them, but from not doing them. It’s fascinating, seemingly counterintuitive, and invites challenges from all of us affronted by the suggestion we know but don’t do what works. But the research and case studies are familiar and much more the norm than not. I found it to be revealing, relevant, compelling, and possessing the potential to fuel changed thinking and actions to create more successful, rewarding businesses. And http://www.change-management-coach.com is pretty self-explanatory. 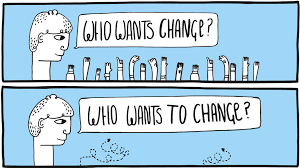 It is a website focused on helping people effectively manage change. Here’s the situation I am addressing. So many business owners, and their teams, confess that they are not satisfied with the state of their business, their business results, or both. They also confess they can’t seem to make the changes or do things different that would address and improve their businesses. The result? Managed mediocrity and misery. There are many reasons for this, but one of the most common is the inability or unwillingness to overcome the inertia of the status quo. And why might that be? Ego. The status quo is likely owner’s or leadership’s creation. The undesired current state or results, and the need for meaningful change may be perceived as an indictment of owner’s or leadership’s capability. I am attaching a simple tool and the link to the tool, Kurt Lewin’s Force Field Analysis Practical Application Tool. It you and your team to execute the Force Field Analysis process to 1) describe a desired change, 2) identify specific “forces” for change and their relative strength, and 3) identify specific resistant “forces” and their relative strength. This process can enable an owner and their team objectively, accurately, and thoroughly identify the variables that are causing the current state, and what can be done to strengthen the forces of change necessary to act, while minimizing, eliminating the resistant forces. You can’t manage what you don’t know and can’t measure. This tool and process addresses and resolves that common but problematic situation. And I cannot recommend enough “The Knowing-Doing Gap.” It may revolutionize your leadership and management perspective, and consequently, your business. I invite you to call upon me to explore my helping you with any aspect of operating your business more productively and profitably.